Sometimes phones just hear what they want to hear. Anyway, she very much enjoyed the pasta and it’s far from the first meal we’ve enjoyed here. 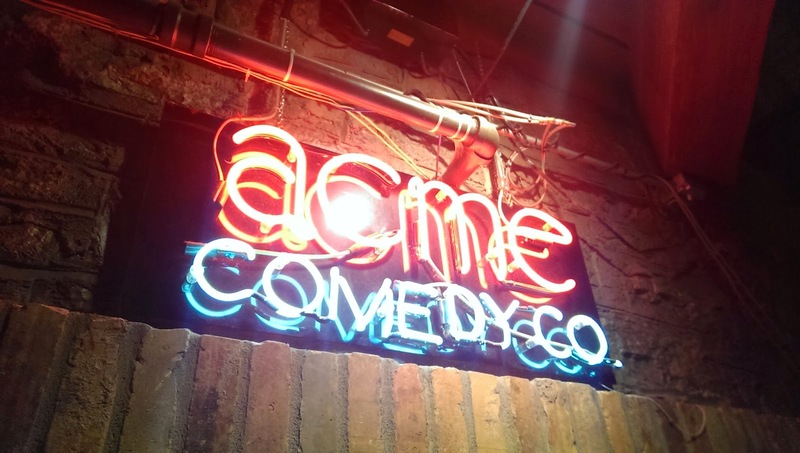 Try it yourself, then head inside for giggles at the adjoining ACME Comedy Company. Endorphin-for-dollar, this might be the best one-two punch in the Cities. The Basics: Technically, I suppose, ACME and Sticks are beneath the Warehouse District in Minneapolis. There’s a pay parking lot across from the front awning, but street parking is free after six and you can usually scoot your hoopdy up fairly close (Are people still saying hoopdy?). You can find their comedy lineup on their website. NOW, I need you to drop everything and sign up for these two below. ACME is giving me nothing for this – this is just me trying to make your life more fun. 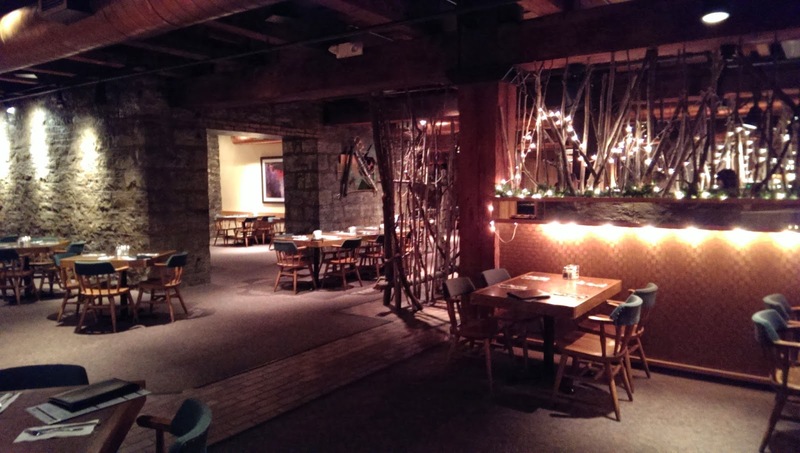 The insider club: Every month, ACME hosts an exclusive show for insiders. Reserve quickly and get two free tickets, with the option to tack on a meal for $10 apiece that includes a beer or glass of wine. The birthday blast: Reserve on the month of your birthday and get four free tickets for a Tuesday, Wednesday, or Thursday show. If your luck is anything like that of my wife and I, the weather will be terrible on the night of the show. As we have so many times, we scurried down the street with our shoulders pushed up and our heads ducked into our jacket collars. We rushed through the subway-style entrance, and into the cavernous lobby. The bar is generic and the beer list is boring, but it serves its purpose of liquoring up the audience and the mixed drinks are worth the $7-8. Want to wait 45 minutes for your friends to arrive – only they were here the whole time, you just didn’t see them? The bar is built and lit perfectly for it. You definitely won’t get blinded by science in this place. Seating in Sticks could go one of two ways: You’re right under a lamp, or in a lightless blotch. We were seated along a cement wall, next to a locked-up window to nowhere. Or maybe the wall’s concrete. Whatever it is, it isn’t old-style stone brick – but if you look closely, you’ll see a hilarious attempt at “drawing” brick lines onto the walls. It’s the structural equal of painted-on eyebrows. The stick-wall dividers are a nice touch. If nothing else, it gives the name a literal meaning puts a little nature into your subterranean meal experience. It’s dark, and it’s woody, and the stone looks ancient, and WHAM! Here comes a waitress in a radioactive pink necktie. The restaurant has never been jammed up, so drinks and food come fairly quickly. The wait staff doesn’t sluff off here. 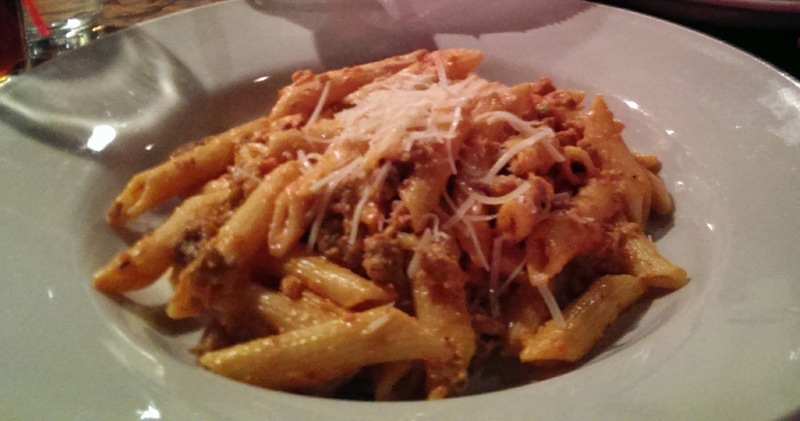 “The penne pasta had that cheesy, kind of spicy, red sauce that was derr-lerr-shursh. And it had those crazy sausage crumbles in there, I forgot what kind, and they had really good bread.” So, there you have it. Now, the menu has steered me wrong before – I’ve tried cheeseburgers and sandwiches at the bar, and they’re about as thrilling as a Hallmark movie – but you won’t find those on the insider night menu. Sticks sticks (I DID IT, YES!) to serving actual meals like pork chops and potatoes or pasta plates like this one. The food isn’t so titillating that you’d come without seeing a show, but it’s much more than just passable schlock. If you ARE catching a show, convenience doesn’t get much tastier than this. On stage, I’ve never seen a bad show. The worst they’ve given me is an okay headliner who wasn’t as funny as the feature (which, if you’re keeping score at home, is happening with this week’s headliner/feature combo). Emcees, usually local comics, kick the show off. Attend as often as we do and you’ll start to memorize their routines. Time the specials properly and do a little YouTubing of the comedians, and you too will be scurrying through rain and snow to give ACME all night. $2.50 beers after the early show. Try not to get too graphic.